The Confederated Salish and Kootenai Tribes are comprised of the Bitterroot Salish, the Pend d’Oreille and the Kootenai Tribes. The Flathead Indian Reservation consisting of 1.317 million acres in Northwest Montana is home now, but CS&KT ancestors lived in the territory now known as Western Montana, parts of Idaho, British Columbia and Wyoming. This aboriginal territory exceeded 20 million acres at the time of the 1855 Hellgate Treaty. 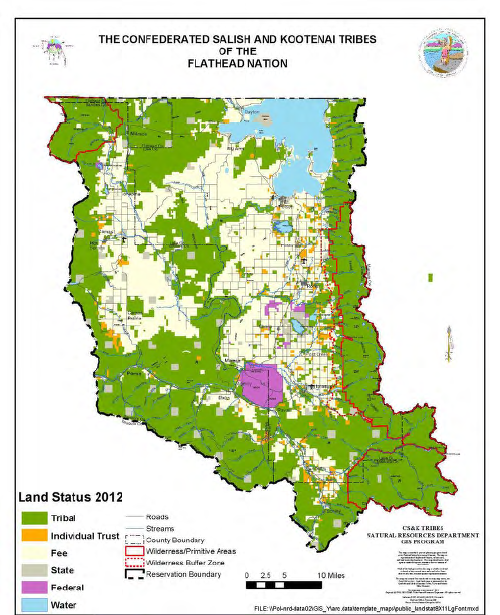 The Flathead Indian Reservation, headquartered in Pablo, is the fourth largest reservation in Montana, encompassing 1.317 million acres in four counties, and is home to 4,550 (64.5%) of the 7,052 enrolled Confederated Salish and Kootenai Tribal members. CS&KT’s youth population (under 18) represents 26.5% of the on-reservation population. There are 1,463 enrolled minor children. The CS&KT Tribes therefore certifies that there are at least one hundred children under the age of majority in the population subject to the jurisdiction of the CS&KT Tribes. TCSEP operates under applicable CS&KT Laws Codified, and Federal codes, statutes, regulations and/or policies specific to a Tribal Title IV-D Program. TCSEP hearings are under the jurisdiction of the Tribal Court located in Pablo, Montana.